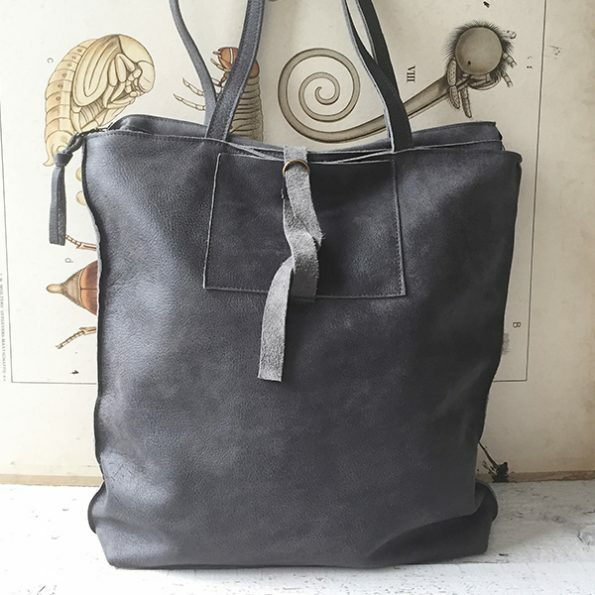 STRUM is made of supple dark grey colored cowhide and with her size of 45 x 45 cm she’s a perfect bag for everyday use. STRUM has a zipper closure. Inside you’ll find an extra large zippered leather pocket to keep all your small items together. Wear her on your shoulder or in your hand. She’s feminine but sturdy and the leather will become even more beautiful over time. Handmade with love for you to enjoy. STRUM is available in a range of beautiful natural colors. Please contact JEE for more info and custom made orders. At this moment we have one STRUM dark grey in stock! Also available in colors black and dusty green. STRUM is not an item JEE keeps in stock. If you order one, JEE will make one specially for you. That means it will be truly your bag, but you’ll have to be patient. Because all bags are handmade, delivery time will be approximately 3 weeks. She’ll be worth the wait!